Left to right: California Natural Resources Secretary John Laird, CDFW Senior Environmental Scientist Scott Gardner and CDFW Chief Deputy Director Kevin Hunting. California Department of Fish and Wildlife (CDFW) Senior Environmental Scientist Scott Gardner has received a Special Thanks for Achieving Results (STAR) Award from the U.S. 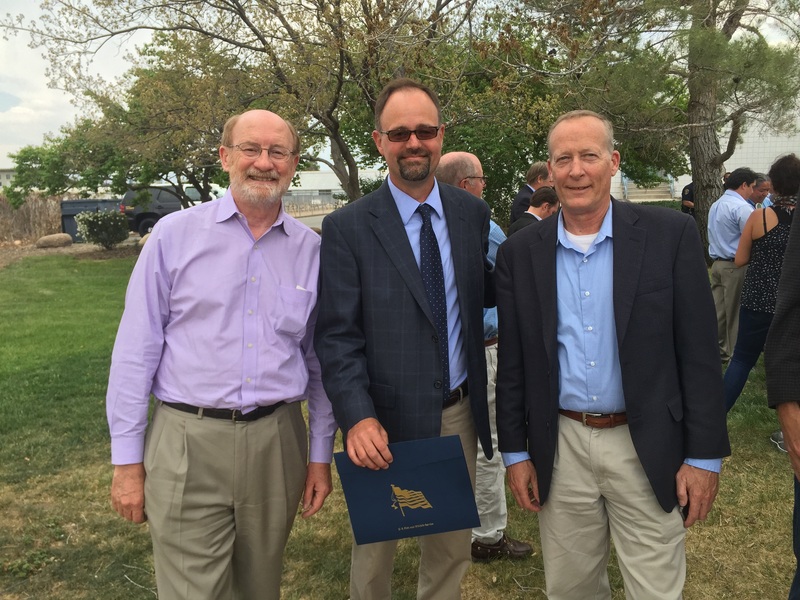 Fish and Wildlife Service (USFWS) for his extensive work on sage grouse. Gardner co-led the development of the Bi-State Conservation Plan for Greater Sage-Grouse, which included the Nevada Department of Wildlife and other stakeholders. He has also collaborated with U.S. Geological Survey scientists to develop a strong science-based approach and led multi-year sage grouse studies that provided critical information to support the plan’s population and habitat models. On April 21, 2015, Secretary of the Interior Sally Jewell, along with Nevada Governor Brian Sandoval and California Natural Resources Secretary John Laird, jointly announced that the Bi-State Distinct Population Segment of greater sage-grouse did not need to be listed under the Endangered Species Act. This decision reversed an earlier proposal to list this population segment as threatened. It was determined the conservation plan developed by Gardner and his colleagues addressed the threats to sage grouse and provided commitments from agencies and the local community. “Developing an action plan that engages the local community, develops critical partnerships and reverses a proposal to list a species goes above and beyond the call of duty. We couldn’t be more proud of Scott and his dedication to wildlife conservation,” said CDFW Director Charlton H. Bonham. In addition to the plan, Gardner had a key role in developing partnerships between agencies as well as diverse groups of public and private stakeholders. Over time, these groups worked toward a common goal to develop conservation agreements, which recognized the value of healthy sagebrush ecosystems to wildlife, people and the local economy. More information about the Bi-State Conservation Plan and the recent USFWS decision are available at http://www.fws.gov/greatersagegrouse/.